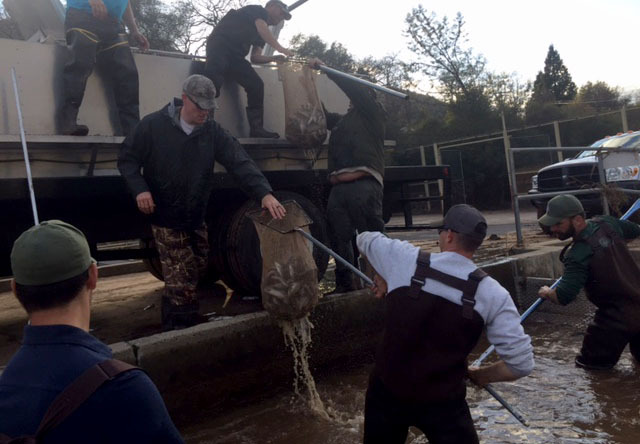 Moccasin Creek Hatchery staff, wildlife officers and fisheries biologists worked into the early morning hours of March 24 to rescue 40,000 pounds of trout from a flooded Moccasin Creek Hatchery and release the fish into nearby Don Pedro Reservoir. Central Valley anglers anticipating California’s general trout opener Saturday, April 28 will find many local fishing opportunities despite the flooding of the California Department of Fish and Wildlife’s (CDFW) Moccasin Creek Hatchery in Tuolumne County, which supplied many Central Valley and western Sierra Nevada waters with trout. Don Pedro Reservoir, located downstream from the Moccasin Creek Hatchery, received an emergency plant of 150,000 rainbow and brook trout late last month when CDFW was granted a small window of time to return to the evacuated hatchery and rescue fish after the hatchery was flooded by a storm-swollen and overflowing Moccasin Creek Reservoir, which sits immediately upstream from it. The total weight of trout stocked to Don Pedro immediately after the flood was approximately 40,000 pounds. This emergency measure made the best use of resources in a catastrophic situation. CDFW biologists, hatchery staff and wildlife officers worked well into early morning hours to rescue fish and stock them into Don Pedro. Don Pedro is home to many species of game fish, but hadn’t been planted with trout by CDFW since 2016. Don Pedro is open to trout fishing year-round. The San Joaquin and Kern River hatcheries, the two other trout hatcheries in CDFW’s Central Region, will continue to provide trout angling opportunities for the area and assist Moccasin Creek Hatchery in any way possible. Approximately 20,000 catchable-sized trout also will be trucked to the Central Region from another CDFW trout hatchery to support recreational angling for the trout opener. As CDFW was able to return to the hatchery days after the flooding and emergency fish rescue, CDFW discovered thousands of additional hatchery trout alive but stranded in ponds and pools nearby created by the floodwaters. CDFW staff rescued approximately 10,000 of these trout and released them into Moccasin Creek. Moccasin Creek opens to trout fishing April 28. At the time of the March 22 flooding, the hatchery was holding about 1.6 million fish – mostly rainbow trout but some brook, brown and golden trout as well – in varying stages of development, from just-hatched eggs to fish weighing 1 to 2 pounds. 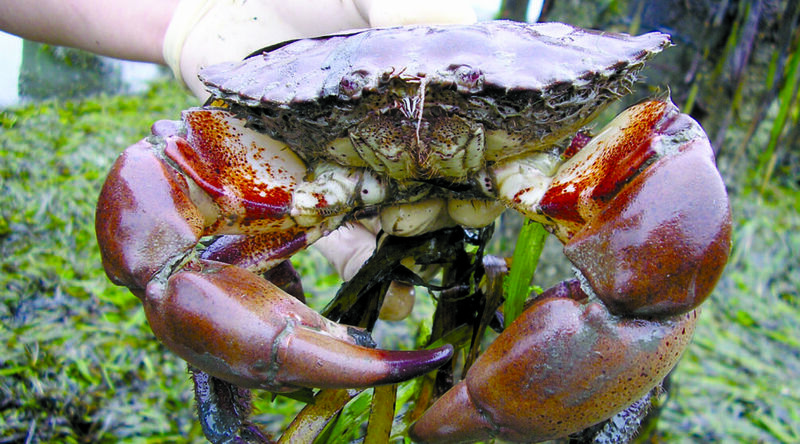 In addition to the loss of more than 1 million fish, the hatchery suffered extensive damage estimated at $3.2 million. 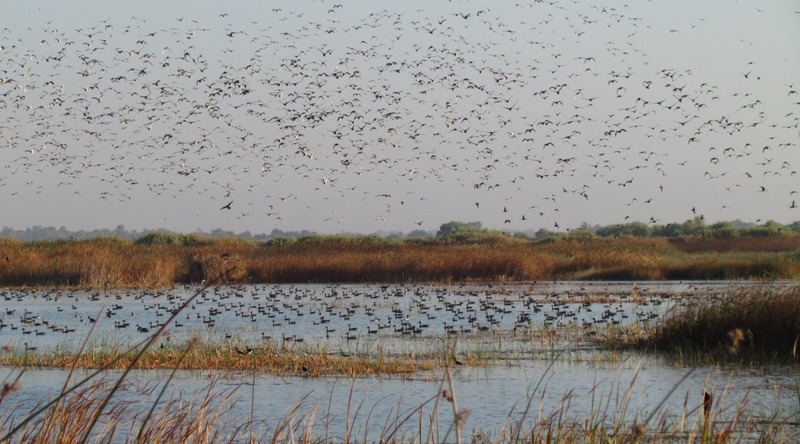 CDFW doesn’t expect the hatchery to be operational until the fall of 2018 at the earliest and the hatchery might not return to full production for 18 to 24 months. In planning to get Moccasin Creek Hatchery back online, CDFW shipped several hundred thousand trout eggs to other state fish hatcheries to hatch and raise for the next several months. Additionally, other CDFW hatcheries set aside thousands of juvenile trout that will be shipped to Moccasin Creek Hatchery as soon as feasible. Moccasin Creek Hatchery sits on land owned by the San Francisco Public Utilities Commission (SFPUC) as part of its Hetch Hetchy Regional Water System. SFPUC staff have been instrumental in providing crews and equipment for the initial clean up of mud, debris and dead fish. Moccasin Creek Hatchery began operations in 1954 and provided trout for anglers who fish a variety of creeks, streams, rivers, lakes and reservoirs located in Tuolumne, Stanislaus, Merced, Madera, Calaveras, Contra Costa, Alpine and Alameda counties. The hatchery produced about 700,000 fish annually. On average, the hatchery planted about 50,000 fish per month, but the numbers often exceeded 100,000 fish in April when waters are stocked just prior to California’s annual trout opener on the last Saturday in April. While CDFW won’t be able to stock all the waters it had planned prior to flooding, CDFW is prioritizing the most popular trout-fishing destinations and plans to stock those waters with excess trout from some of its other 14 trout hatcheries around the state. These waters include Pinecrest Lake, Lyons Canal, the Clark’s Fork of the Stanislaus River (once the Sonora Pass opens), the Middle and South forks of the Stanislaus River, and the Middle and South forks of the Tuolumne River. All of these waters are in Tuolumne County. Central Valley anglers making plans for the April 28 trout opener should check CDFW’s Fish Planting Schedule to see if their favorite waters have been planted with trout.